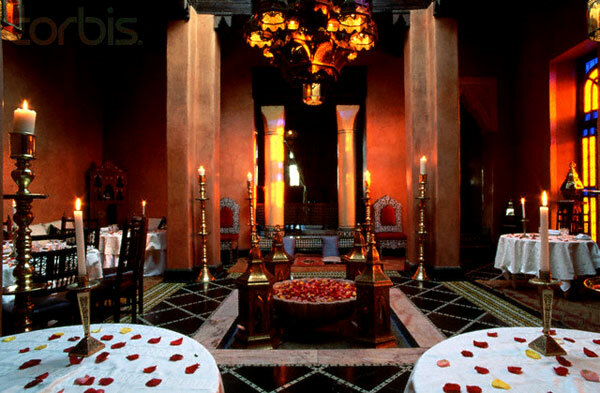 Dar Yacout is not a restaurant but a legend..an experience you have to live if you are visiting Marrakech. Your journey begins through a dark narrow street in Medina to a giant nondescript door off an alley, which openes by Ibrahim…When you enter that door the world around you totally changes. Once inside, you are guided to the rooftop terrace with a great view of Medina, (or in a fireplace-warmed lounge when the weather’s chilly) to have your aperitifs.. 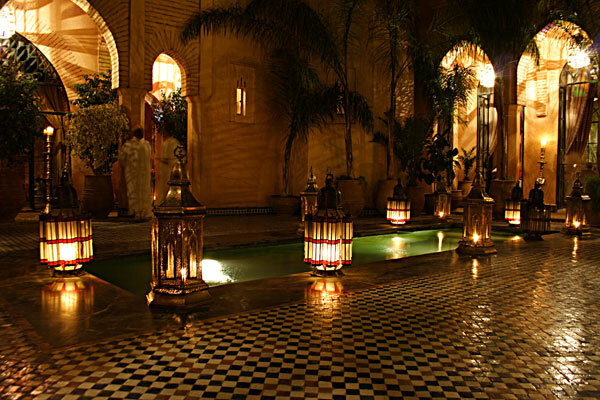 The building has renovated 20 years ago by American architect Bill Willis who turned a cluster of mansions into a labyrinth of secret salons and patios, most sporting carved cedar ceilings, mosaic floors and fountains, exotic columns, and countless lanterns. Even the bathrooms have sculpted fireplaces. 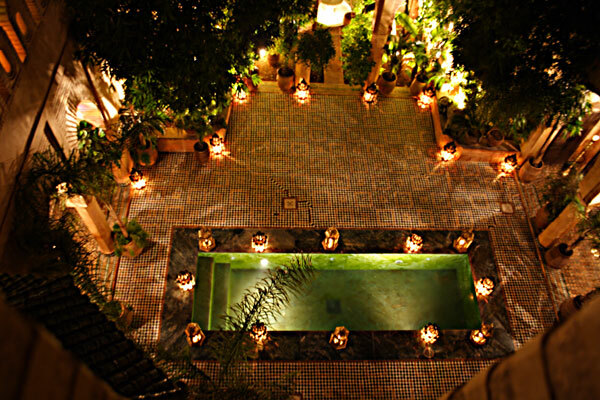 Guests are seated on two levels around a courtyard with a beautiful pool and entertained by Ghana musicians playing a trance-inducing Moroccan form of blues. The food just keeps on coming, course after course after course: pickled and spiced vegetable salads, lemon and almond chicken tajine, tender shoulder of lamb, vegetable couscous, and ultimately pastries, tiered trays of cookies, and mint tea. 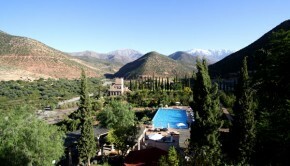 Don’t forget to make a reservation days ahead..